I’ve been a bad blogger for… well, awhile. I had a nice stride going in 2008-2009 (you know, back when I was despairing about life and could basically blog at work); then I got into grad school, and it’s really been hit or miss since then. I’ve been busy busy busy, I’ve had to teach, I’ve had to write papers, I’ve had to study for exams, I’ve had to write a dissertation proposal, I’ve become a father, and so on. Here’s the thing. I’ve thought about formally closing it up. Leave it online, as a snapshot of something I did for awhile, but put up one final post saying, I’m done, look for me when you see me. See, I don’t write this for hits. I don’t care if nobody reads this, and I never have. I write this for myself. In the beginning, it was so I could have an excuse to do something to build up some discipline where writing was concerned. Somewhere along the way, I wrote a couple of things that a few people liked and linked to, and before I knew it, I was… a really marginal figure on the fringes of a really marginal subculture of blogging. My biggest day was 906 views; historically it’s been more like 100-150 when I’ve been really active. It’s surprised the heck out of me when people I have met have said, “Oh, yeah, I read your blog,” because that’s incredibly unlikely, statistically speaking. But whatever; that’s not the point. You don’t do public access for the ratings. Anyway, I still have things I want to say for myself in this venue, so even if it’s not consistent enough to “build readership”, that’s not really of interest to me. I’ll say things when I have them to say. I have ongoing things here and elsewhere I need to finish; I will finish them, and I’ll continue writing other things. So, I’m still here, but look for me when you see me. One item of national (more or less) news I want to say something about very briefly — maybe 12, 13 years ago, the friend who was my best man was telling me about a new church venture he was involved with in West Seattle. This friend had long been involved in “postmodern Christianity”, an approach to “doing church” that, as he put it, didn’t assume that anybody walking in the door knew anything about what was going on. This new project in West Seattle was going to draw on elements that contemporary American Protestants generally ignored, like liturgical seasons, and explore the reasons for why those things had become a part of the tradition in the first place; it was also going to work cooperatively with a group of other local churches, centralizing administration and using that centralization as a way of helping to organize leadership and planting across that group of churches. This West Seattle church was being organized, at least at first, by a pastor to whom many of my friends from Bellingham had been close; he had been involved with The Inn campus ministry up there, and was now getting this going. Except now Doxa is called Mars Hill. You might have heard of it. Also, it’s not part of Acts 29 anymore. Further, Bill Clem hasn’t run it since 2006; he’s now in Portland, and is advertising his connection in his current professional biography neither to Doxa or to Mars Hill. I have a lot I want to say, but I will limit my comments to this: if I were Bill Clem, I would be thankful that I managed to get out when I did, and whatever the circumstances were that forced me out of what I had worked my tail off to start, I would call them God’s providence. I’ll leave that there for now. To make at least a nod towards catching up — the last several months have been among the most stressful of my life. We learned at the beginning of April that we’d be spending the year at Holy Cross Greek Orthodox School of Theology; that was awesome, but it meant we had a move to prepare for with a kid and a parakeet, to say nothing of a house that had nine years’ worth of stuff packed into it that would have to be pared down for a two bedroom apartment. At least one garage sale seemed in the offing; it turned out to be two. I also had a summer course to teach — a six weeks long medieval survey course, starting 23 June and going two hours a day, Monday through Thursday, until 1 August. I had never taught my own course before, and I had a lot of materials to prepare. I had three conferences over the course of the summer that I knew were coming, too; I had a paper to present at the International Medieval Studies Congress in Kalamazoo, MI, where I was also one of the organizers for two sessions sponsored by the Byzantine Studies Association of North America, and where I was also participating in activities related to my service on the Graduate Student Committee of the Medieval Academy of America. Then, in June, I had Kurt Sander’s 2014 Pan-Orthodox Liturgical Music Symposium at Northern Kentucky University, where I was going to be singing in their festival choir, presenting a status report on the Psalm 103 Project, and also giving a talk on the Anglophone tradition of Byzantine chant. Oh, and we were trying to organize another working session for all of the composers while we were there, too. Finally, in July, we had the wedding of an old friend in Cleveland (also Theodore’s godfather), in which I was an attendant. I also knew I was going to be presenting a Byzantine chant workshop at the Mid-Eastern Federation of Greek Orthodox Church Musicians at the convention in Columbus, Ohio. Right. So, preparing for a move, teaching a class, a wedding, and presenting at three conferences. That was enough, right? Then there was an issue of availability with respect to the other course assistants for the professor I was working for last spring. One was an international student whose visa was expiring just in time to preclude their ability to do any grading of the final whatsoever, and the other was somebody who was just having to leave town the Monday after Finals Week. With around 150 exams to grade… yeah. Something got worked out where I got paid something extra for doing it, but from Sunday night when I got back from K’zoo to Tuesday afternoon when we were having to get ready to drive to Chicago, I was eating, sleeping, and breathing blue books. Oh, yeah, one other thing — in April, I took my beloved 2000 Subaru Outback, which I had bought in 2000 with five miles on it, in for an oil change, tire rotation, and alignment check. I got it back with the technician saying that I needed to get some rust on the rear subframe looked at. The manager of a body shop took one look underneath the car and said, “Wow, that’s scary. You don’t want to drive on that.” (This was the week before I had to drive to Kalamazoo and then to Chicago, I should note.) When asked what it would probably cost to fix, he said that it would probably be upwards of a number that was more than the car was worth by this point. Because, you know, this was the perfect moment in our lives to be needing to buy a car. A rental car got me to and from Kalamazoo and then to and from Chicago for the Los Angeles trip. The Subaru — of blessed memory — wound up being replaced with a 2014 Chevrolet Equinox after I got back from LA; I am eternally grateful to my mother and stepfather for what turned out to be an early PhD graduation gift. The Los Angeles trip was, I have to say, a blast. A full write-up deserves its own post; suffice it to say that it’s an experience I hope to repeat. Then Lycourgos Angelopoulos passed away. Memory eternal. Kurt Sander’s Symposium was a wonderful experience; a somewhat abbreviated version of the writeup I was asked to contribute may be found here. My presentation on the Psalm 103 Project is here; the audio of my Byzantine chant talk is here. Then Richard Toensing passed away. Memory eternal. And then we packed, I taught my first class as the instructor of record, we went to the wedding in Cleveland, and I went to the last of my conferences. And then we moved, leaving our house on 1 August, with a move-in date of 11 August (that actually turned out to be 10 August). We killed time in Chicago, Cleveland, and South Canaan, PA.
Did I say that the last few months were stressful? They were stressful. Yeah. I’m in Boston, by the way. We’ve been here for a day over four weeks; it’s been lovely so far, and we actually wound up getting a three bedroom apartment. The first three weeks was a bit of a vacation since the school year wasn’t yet going and the library had really limited hours; we enjoyed mild, beautiful, coastal weather; I’ve chanted in the chapel; I subbed unexpectedly for a few services at a Greek-only parish (that, I have to say, pays their chanters verrrrrrry reasonably); we enjoyed seafood on the wharf and a tour of Boston Harbor on a tall ship; we got unpacked; we made nachos. Last week was the start of the term, and I’ve been clearing the decks since then, dealing with a to-do list of administrivia that has managed to build up since we left Bloomington. It’s all stuff that’s had to get done for me to be productive in the way I need to be productive here, and I think I’ve got the list checked off sufficiently that I can actually get to the concrete work I need to do here on my dissertation. Your birth, O Mother of God, revealed joy to the civilized world, for from you the Sun of Justice rose, Christ our God, having destroyed the curse he gave a blessing, and having abolished death, he gave us eternal life. It’s curious for a number of reasons; one is that the Latin version is in the first mode, and the received Byzantine version is in the fourth. However, 10th/11th century Menaia show an ascription of first mode rather than fourth, suggesting that the Latin books preserve an older practice. More curious is this — in the late seventh century, one of the so-called “Byzantine popes”, Sergius I, imported the Feast of the Nativity of the Virgin onto the Roman calendar as one of a group of Marian feasts. This would, theoretically, have been a moment of liturgical unity between Rome and Constantinople; and yet, this hymn is the only piece of it that really survives. There’s a paper I wrote on this several years ago, the first paper I ever wrote for a grad school class, that collected several observations about this issue. Some of the observations might be still valid, but I probably did a lot I was in no way qualified to do at the time and probably got a lot wrong. I’ll revisit it down the road when I need articles for the tenure clock, but I think that I actually need my dissertation done first, both so I can actually get a job, and also because I think any argument I’d make about this now would depend on my dissertation’s argument. So, I’ve got to get the dissertation done — which is what I’m here to do — in order to finish the work that helped get me thinking along the lines of my dissertation. (I’m also going to take the Byzantine Chant certification exam while I’m here, but that’s a separate post.) It’s a dissertation that is largely inspired by those observations made back in 2006, so it seems appropriate that today’s the day I finally get settled enough to get down to work. I will keep up with things here as I can; I’m not going to close up shop until I want to, even if that means not posting as often as I’d like, or if what I post winds up being somewhat random. First priority is getting the dissertation done and out the door; I want a real job before I’m 40, even knowing full well that I’ll then be busting my chops racing the tenure clock. Oh well; that’s the life I’ve chosen, and I’ve got to get past at least the first finish line, even if it’s not really a finish line by any reasonable definition. I’ll be trying to pop back here when I can, at any rate, and hopefully that’s more often than it has been. We’ll see. That’s what I walk past on my three minute and forty-five second commute home. It’s not a bad state of affairs by any means. It’s the Barretts’ last night as residents of Bloomington, at least for the foreseeable future. I got here 3 weeks shy of 11 years ago, coming here with the specific objectives of finishing an undergrad degree in voice, possibly going on to a Masters, all in the service of the overall goal of setting myself up to be A World Famous Operatic Tenor. Seattle was a place you could be from and do that, but not if you never left Seattle, and IU seemed like just the kind of place where I could get what I needed in terms of final polish and stage time. I figured we’d be here three years tops. 11 years is almost 30% of my life, over 80% of my marriage, 100% of my time as a father, 100% of my time as an Orthodox Christian, 100% of my time as a Byzantinist. I arrived thinking, based on what I had been told in Seattle, that I had most of what I needed to put together a great operatic career, and I just needed to get the right opportunity onstage in front of the right people. I leave with such musical successes as I have had being elsewhere than the operatic stage, with the vast majority of my success being in the academic arena rather than in the performance arena, and with the platform I have had for that success being largely hard-won. I arrived hoping I would get to learn French, Italian, and Russian. I leave with some competency in French and Italian, yes, but also having studied Greek, Latin, Syriac, and Arabic (and brushed up on my German). I arrived thinking I’d be making my name as somebody who sang high notes down center onstage. I leave building a profession of lecturing at the front of a classroom. I arrived thinking that maybe I’d get a Masters. I leave in the process of finishing a PhD. I arrived thinking my wife is brilliant; I leave knowing that she is, and that that is only one of her many amazing qualities. I arrived scared of fatherhood. I leave loving it, and wanting more. I arrived having wanted the chance to travel really badly since I was a little kid. I leave having been to some pretty cool places like Greece, England, New York, Washington, D.C., and so on. I want to wrap this up with a simplistic “I arrived a boy; I leave a man” but that’s false. I’m 37, married, with a toddler, and I’m still — as one person phrased it — in the U-Haul stage of life. Whenever it is we do wind up in a position to buy our own home, I expect that we will probably live in that first bought home for less time than the nine years we have spent in our little rental house. I hope and pray that I will have a real job before I’m 40; God knows. I had what would count as a “real job” from the time I was 21 to the time I was 26; I guess I’ve done some things in the wrong order. Oh well. For the last five years I’ve enjoyed the ride at least, which is more than I could say about big chunks of the previous six years, and I can look at the experience in its totality and see that nothing was lost, only that some things were transformed. Two organizations/communities in particular have meant a great deal to me in my time here and have a special place in my heart — The Archives of Traditional Music, where I worked from April 2008-June 2009, and Holy Apostles Greek Orthodox Church of Indianapolis, where we have gone to church since January 2013. These were both places where warm welcome and appreciation were expressed at very key moments, and they both allowed the space for me both to do things I was able to do as well as to consider bigger possibilities I hadn’t thought of before. Another thing they have in common is that I got to spend far too little time at both places — just over a year for ATM, and about a year and two-thirds for Holy Apostles. Much gratitude to Alan R. Burdette, Marilyn Graf, and Susie Mudge at ATM, and another generous helping of thanks to Fr. John Koen, Debbie O’Reilley, Panos Niarchos, Angelo Kostarides, Dr. Thomas Kocoshis, Peter Americanos, and so, so many more at Holy Apostles. Special mention to Dean Maniakas and Fr. Bill Bartz of Holy Trinity Greek Orthodox Church in Indianapolis, who have made us feel incredibly welcome and who have made it clear that we have friends at Holy Trinity. I have not always enjoyed the experience of the last 11 years, as both of my longtime readers doubtless well know. Still, I am grateful to have had it, even if I still massage some literal and figurative scars that serve as reminders of certain lessons. Time to go. Tomorrow we’re out of here. See everybody in Boston when we arrive. Glory to God for all things. I’m somewhere between 3-6 weeks from leaving Bloomington. Our lease is up 1 August; we have a move-in date at Holy Cross of 21 August. We’re seeing if we can close the gap at all, but we won’t know if that will work until next week. We’re getting ready to sell one of our cars. We’re packing. I took a load of clothes to Goodwill two days ago. We just wrapped up our last moving sale. We’re selling books. I’m thinking a lot about what I’ve learned from living in Bloomington the last 11 years. The vast majority of my marriage has been here. The entirety of my experience as a father has been here. I have been in school for all but eight months of that time. I converted to Orthodox Christianity here. We’ve not only outlasted just about everybody who started here with us, we’ve outlasted just about everybody who ever knew them. The nine years we’ve lived in our little rental house has been the longest I have ever lived in the same place, and it has been a home even when, at times, Bloomington itself has defiantly refused to be. I have written a lot in this blog about the experience of this town (like this, for example) from my vantage point as a university student, an Orthodox Christian, a worker bee, the spouse of a graduate student, and a church musician. I have found myself deeply concerned about and involved with mission from those perspectives; I have been, in many ways, an envoy on behalf of Orthodox Christianity to this strange university town that is Bloomington, but I have also had to represent the university to Orthodoxy at least as often. As a result of these activities, I believe very strongly that there is much to be done in and for Bloomington that is not being done. Before I go into that, though, you need to read this. Also, there’s something we have to establish first. There is not an Orthodox church in Bloomington. There is an Orthodox church with a Bloomington address, yes, but particularly from the standpoint of an Indiana University undergrad without a car, that really is not the same thing. Regardless of what post office serves it, it is two and a half miles into unincorporated county; none of Bloomington’s municipal services reach it (including the bus), it is part of Perry Township, and it is closer to Smithville’s town center (1.6 miles) than Bloomington’s (6.2). (“But Smithville isn’t a town! It’s nothing!” I’m hearing some people say. Right. That actually underscores my point.) For all practical purposes, it is the closest Orthodox church to Bloomington, perhaps, but it is not a Bloomington church. That’s not a bad thing in and of itself; it’s a great thing for the people who go there. As I’ve written before, its own population is made up largely of people from areas peripheral to Bloomington; a fair number of people drive up from points south to attend there, and it serves that population very well. But, again, it is not a Bloomington church in the sense of being accessible to people who live and work in and around the university campus and the downtown area. This is manifest in the fact that IU’s OCF chapter isn’t even part of the Campus Religious Leaders Association here. it’s not a competition, but today I remembered that Bloomington is the best place to live in the world. Everything you could ever want in a city…on a much smaller scale. Now, there are multiple churches in Bloomington for which this is true, and what is further implied is proximity to the university; if you are Anglican, Presbyterian, Lutheran, Unitarian, Methodist, Evangelical, Roman Catholic, Disciples of Christ, Mormon, Christian Scientist, American Baptist, Church of Christ, United Church of Christ, Korean Methodist, Jewish, or Muslim, there is at least one congregation within a 5 minute bike ride or so from campus if not a 5 minute walk. Then, yes, from there a short hop, skip, and a jump to a coffee shop etc. And, if you’re Lutheran or Anglican, there’s even a campus house for you. Let’s at once broaden and narrow the scope. Let’s broaden to the whole of the Big 10, and narrow to Orthodox churches specifically. Here’s a quick ‘n dirty chart for Orthodox churches in the Big 10 (click to enlarge). For each school, I list the number of parishes within 10 miles of campus (according to Google Maps and OrthodoxyInAmerica.org), the parish that’s closest to campus and its distance from campus (again, according to Google Maps), whether or not that’s walkable (that is, 2 miles or less from campus), walking time if so, transit time from campus to church via public transportation if applicable (again, according to transit data provided on Google Maps), drive time, the size of the metro area by population, and other relevant data. We have to be careful here — these numbers don’t adequately take into account the size of the campus’ footprint and how that might impact distance from church, for example, and not everybody lives on campus. Still, I think there’s a decent initial picture that emerges here, even if it is a little rough. 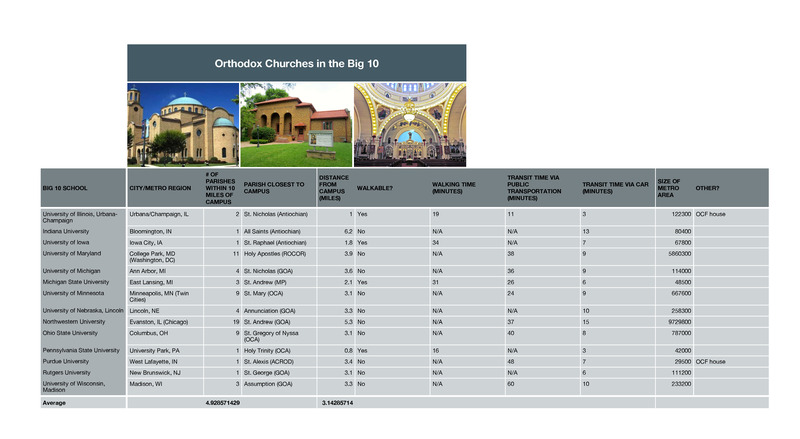 So, with those numbers, on average, throughout the Big 10, there are about 5 Orthodox churches within 10 miles of the campus, and the closest church is an average of 3.14 miles away. Again, we have to be careful with what we’re looking at; these averages are driven up by Northwestern, for example. Northwestern has 19 Orthodox churches within 10 miles by virtue of being in Chicago, but their closest church is also, across the Big 10, the second farthest, at 5.3 miles away (and a pain in the neck to get to from campus, I’m told). Also, Penn State, University of Iowa, and University of Urbana-Champaign are doing really well in terms of proximity; I know from personal experience how walkable St. Raphael of Brooklyn Orthodox Church is from University of Iowa, I’ve visited St. Nicholas at UIUC, friends of mine live in State College, PA, and those parishes really are standouts in terms of making themselves accessible (plus UIUC’s OCF has a house and an alumni association). Throughout the rest of the Big 10, in the main it’s not too bad, with churches being basically a 5-10 minute drive away. Public transportation doesn’t tell a great story there, with 5 schools not having Sunday bus service, and it taking 30-40 minutes to go 2-4 miles in those places that do have it on Sunday. We could be doing better in specific cases; we could also be doing a lot worse in terms of averages. Here in Bloomington, the church that’s here is the one that’s the farthest away from campus in the whole Big 10; if you look at the campus religious guide linked to above, you’ll see that, except for an independent Baptist church one town over, it’s the farthest listed congregation away from campus of all of them. A 15 second walk to a coffee shop afterward? Heck, even a 15 minute walk? Nope, the nearest coffee shop according to Yelp is 2.6 miles away. My friend’s praises of Bloomington’s walkable accessibility simply don’t apply here; for an Orthodox undergrad without a car, getting to church on Sunday here is an exercise in tracking down a ride and going out to the middle of nowhere. To refer back to the linked Antiochian.org article above, in which ACROD’s Bp. Gregory expresses the hope that “our young college students will not only stay connected but deepen their faith during their years in post-secondary education and graduate to be faithful stewards of parishes across the country”, I have seen this lack of proximity and accessibility function as a major barrier from keeping young college students connected. I have also seen it work, to be sure, but the distance remains something that has to be overcome a lot of the time. Indiana University is home to around 42,000 students, 3,000 faculty members, and I have no idea how many other staff members. There is a humongous international population here. It is home to major centers of scholarship for early Christianity, Modern Greek, the Middle East, Russia, the Balkans, and Eastern Europe (and that’s all about to become a much bigger deal with the School of Global and International Studies). It is a very attractive place to be for people who are either cradle Orthodox or otherwise interested parties. There are a lot of thoughtful people here in general who would likely be open to what Orthodox Christianity is if it were but visible in the middle of the community. The parish with a Bloomington address but that isn’t actually in Bloomington is not in a position to engage such a population; they are more of a mission to rural southern Indiana, and, again, they are doing very well with that as their mission field. The situation that is here in Bloomington is one that is ripe for a jurisdiction to take advantage of, and to build a flagship parish that would be a model of pan-Orthodox (in the best sense, where distinct traditions are acknowledged and embraced) university ministry. A parish close to campus, that can be accessible to students and faculty (and anybody else), that can be a resource for the departments and faculty whose work involves Orthodox Christianity, that can be a resource to the greater community about Orthodoxy. A congregation that can be connected to the IU community, and that can be home-away-from-home for students, be they Greek, Russian, Arab, Anglo, Georgian, or whatever. A place where serious, sincere conversations about Orthodox Christianity, be they with students who need an ear or with adults who have hard questions, can happen on Orthodoxy’s own turf and terms. Perhaps a parish that can support a house. A parish where students who want to learn more about Orthodox music can do so. A place where the greater Bloomington community is just a walk of a minute or two away, where the parish can throw open its doors to the greater community and the university, and where the parish can function in a manner that is connected with the community and the university. Is this all a tall order? Yes. This would require, first and foremost, a great deal of prayer and guidance; it would require a bishop (if not multiple bishops) with vision and savvy; it would require a multitalented priest; it would require some cooperative and interested faculty (perhaps the easiest part, frankly); and it would require a lot of money and clever marshaling of resources, plain and simple. This is a big idea. At the same time, I have seen how this place works for the last eleven years; I’ve been an undergrad, staff, and a grad student here; I was actively involved in OCF for three years, hosting it at our house for one of them; I’ve organized a lot of events on campus; I was part of an attempt to cultivate an IU Orthodox alumni association; I have listened to what a lot of people have to say about why some things work here and some don’t in terms of church, university, and community. From what I’ve seen and heard, I firmly believe that it can be done with good planning, good leadership, and building of goodwill. More importantly than it being possible — it is needed. There’s another component that’s vital here, and that’s creating an opportunity for Bloomington’s cradle community to fulfill the Great Commission in their own lives. For various complicated reasons, some of which I understand and others I don’t, many of them choose to not attend the parish that has set up shop in unincorporated county; some of them have lamented to me that, were there a church closer to campus, they would be more involved. Well, this would be exactly that chance — but besides being close to campus, it would be a chance to reach out to young people who wouldn’t really be able to pay them back, or even really be able to support the parish. Nonetheless, this would be good soil for those young people and students. It would be an opportunity for Bloomington’s cradle community to gather together, pool their resources, build something, hire someone, and pray hard. Even beyond that — here’s an opportunity to make this a movement, a change in the way jurisdictions think about how they plant churches in college towns, with cradles and converts alike encouraging their families in other college towns to make sure that there is a church within walking distance for Orthodox young people, and supporting exactly that in their own areas. Bloomington definitely isn’t the only college or university that needs this vision; it isn’t even the only Big 10 school that needs it. Still, it might need to be the place where it gets started. How might such an undertaking be planned? Well, as long we’re dreaming here — if there were already sufficient seed funding to get something established, as well as a blessing from a bishop to form a parish with an assigned priest, two things would be important immediately, from where I sit. The first thing to do would be to form a non-profit organization that would serve as the umbrella organization for the education and culture side of things, with the board consisting of people in the community, Orthodox and non-Orthodox alike, who have an interest in furthering those aims, with at least one student representative. Then, what would be great in terms of establishing initial visibility as well as the pan-Orthodox nature of the effort, would get it set up at a location — even if it is temporary at first — that is visible and easily accessible from campus, then inviting all of the bishops for the area — Metropolitan Nicholas of Detroit (GOA), Bp. ANTHONY of Toledo (AOCANA), Bp. Peter of Chicago (ROCOR), and whomever else would be appropriate — along with somebody like Donna Elias, National Programs Manager for OCF, and then the priest for the chapel as well as all other area clergy to come to open it, with a procession from the Monroe County Courthouse in the square to the chapel’s location. It would be vital to see that it is well-publicized, and to treat it like a public event of community interest. That’s where I think it could start. You’d have to do it in phases, certainly, and those would be negotiable — but something that would need to be treated as absolutely non-negotiable and vital to the exercise is proximity and accessibility to the university. It would be a tragedy to start out in a temporary location that’s a 30 second walk from Kirkwood Avenue only to wind up on the far west end of town halfway to Bloomfield. That would require, again, being smart and careful in terms of planning. Now, I know full well that nobody is going to read this and say, “Well, heck, what are waiting for? Let’s do it!” I have no illusions about that. My point is simply that there is so much that can be done here, so much that needs to be done in terms of revealing Christ to Bloomington in the Orthodox Church; it’s not going to get done by one person with a vision, not by a long shot, but somebody has to be willing to commit to forming a vision for this kind of university ministry, articulating it to the people who can participate, and then bringing it about with God’s help. It can be done here, it can be done right, and I think it can even be a model for how you do it right. The harvest is plentiful if the workers will be there. So, a couple of months ago, I suggested that learning to sing needs to be part of learning to chant, and even suggested that language and diction in the appropriate languages should be an expected part of one’s training, just as it is for a classical singer. I’ve continued to chew on some of the implications of that post, and one of the outcomes of that was to draft a proposed curriculum for what a Byzantine chant concentration could look like in the context of an undergraduate music program. Obviously, this is all entirely hypothetical; I don’t know of any music schools that are itching to add this as a concentration. St. Katherine’s College could, I suppose, eventually try to incorporate something like this into their curriculum, but who knows. Hellenic College would probably be reasonably well set-up to do something like this, but they don’t even presently offer a music major. A few assumptions I’m making: first and foremost, that there is an on-campus chapel with regular services. Second, that chapel services would make a full-on recital unnecessary; rather, have the student do a junior and senior exam that basically are an extended jury — where they prepare a certain number of compositions ranging in difficulty and sing 2-3 of them at the request of a committee. Third, that building a good cantor who is also a good musician will require some knowledge of Western music theory and notation (I’m less sold on keyboard skills, but it still seems instinctive to me to include) in addition to Byzantine music theory and notation. Fourth, that voice lessons won’t concentrate on things like “Caro mio ben” or “Silent Noon”. They may well include that kind of repertoire if the student really wants it and the teacher is able to do it, but beyond the universals of healthy production, the specifics will by and large be those of psaltic technique. Fifth, that the academic environment would be such that it would allow for patristic and theological discussion to occur within the context of music history courses. One observation I make immediately is that this is a very full undergraduate degree. I started off with IU’s B. Mus. in Vocal Performance as a basis, while also consulting their Early Music Vocal Performance B. Mus., and then worked from there to focus it specifically on the requirements of Byzantine chant. As with IU’s Vocal Performance B. Mus., the general education requirements are quite minimal, but it’s still jam-packed. I think the keyboard skills part could perhaps be taken out/made an elective, maybe a case is made for 2 languages rather than three, and maybe you either don’t do credits for Chapel Choir or tweak the number of credits for voice lessons. But, all that said, the B. Mus. at IU is a very full degree, and that’s just how it is. It seems that a couple of other useful curricula to come up with would be a B. A. degree, and perhaps a more general “Orthodox Liturgical Music” degree. It’d be nice to also include a course or two on Mediterranean folk music to be able to show the relationship between liturgical and vernacular musics (hinted at in the bit about “Mediterranean instruments”, which also assumes that such instruction would be available), but maybe that would have to be kept for the Masters degree. Anyway, here’s the draft. I’m curious to hear thoughts. Chapel Choir (1 cr.) required every semester of enrollment. Voice. 3 credit hours each semester until senior exam is passed, at which point they may be reduced to 2. Required: entrance audition, freshman jury, upper-division examination, junior exam, senior exam. All students must pass a keyboard proficiency examination. Voice majors must take an examination for placement in a 3-semester class piano sequence (2 credits per semester) or take elective individual lessons (1-2 credits per semester) and continue study each semester until the keyboard proficiency examination is passed. The above must be passed with a C or better. English Diction for Singers (1 cr.). Electives: 6 credit hours, including a minimum of 2 credit hours in pedagogy courses such as Introduction to Music Learning (2 cr.) or Vocal Pedagogy (3 cr.). Electives may also include courses for music majors in sacred music, music education, techniques, conducting, composition, music history, music theory, opera, and unclassified courses. A maximum of 4 credit hours in early or Mediterranean instruments may be counted in this area. Foreign Language 12-24 credit hours or proficiency, equivalent to two semesters of first-year language study. Greek: Elementary Ecclesiastical Greek I (4 cr.) and Elementary Ecclesiastical Greek II (4 cr. ); or Accelerated Ecclesiastical Greek (4 cr.). Arabic: Elementary Arabic I (4 cr.) and Elementary Arabic II; or Accelerated Elementary Arabic (4 cr.). Free music or non-music electives as needed to bring the total credit hours to 120, excluding Chapel Choir. Tags: aaron st. clair nicholson, adolescence, alana van ness, Arwyn Moilanen, bellingham, bellingham herald, bettyrae easley, brian ward, carmina burana, computer city, david harsh, dennis kruse, do not drop out of college, eric rachner, flexible figaro, gabriel faure, gianni schicchi, Holly Zehnder, i said do not drop out of college, j. p. hennessey, jeffrey gilliam, JOHHHHHHHHHHHHHN Davies, Jon Haupt, Jon Lutyens, Jordin Peters, Kai Morrison, Liz Holmes, marriage of figaro, Matt Carter, matthew murray, Mike Cook, my brilliant wife, Peter Smalley, please don't drop out of college, Sarah Wright, Sue Fletcher, Suzann Welch, Tom Baugh, virginia hunter, Western Washington University, will bass, windows 95, wwu's "the ridge"
Exactly what would happen to me following high school graduation was a point of no small controversy. My parents wanted me in Alaska with them as soon as possible and to stay up there as long as possible. The stated reason was so I could work as long as possible; there were at least two other reasons, however, that are probably best summed up by saying that me going to college “in state” (that is, in Washington), while it had seemed like a great idea up until summer of 1993, now didn’t seem like such a hot deal from a familial perspective. At best I’d now be a three hour flight away instead of an hour and a half’s drive (not that I had a car anyway), and while I still had incentives to go back to the Seattle area on the weekends, they weren’t part of it. My parents were going to have to deal with an empty nest in a place that had never actually been our nest, and they would have to do so with me relatively inaccessible. This is, I am certain, difficult under the best of circumstances, and the family difficulties we had been struggling with for the past several years meant that these were not the best of circumstances. The bottom line was that, for that last summer before college, I really didn’t want to go to Alaska and they really didn’t want me to stay in Seattle. I had no desire to go someplace that I had no real memory of to be around two people who were likely to re-negotiate the manner of their life together after a year apart in a way that was going to be extremely unpleasant for any additional parties. If the point was for me to work, I could do that in Seattle without paying for a plane ticket; from where I sat, that made a heck of a lot more sense than forcing me to be a continuing participant in their drama. I had people I wanted to be around, but that was also part of the issue for my parents; they weren’t people they wanted me to be around. There’s not much more I can say about that without getting into specifics that aren’t appropriate for me to get into, so I’ll leave this by noting that I had a conversation with one parent where I expressed all of my concerns quite openly; this parent replied, well, yes, that’s all probably true. It isn’t going to be fun, and you’re probably going to have to deal with us fighting a lot. But that’s the way it goes, we’re a family, messed up though we may be, this is the way we want it for you right now, and we’re still in charge. This was a growing source of tension as high school graduation neared; ultimately, however, there were two things that threw a wrench into the plan for me to be in Alaska for the entire summer — one was early orientation for Western Washington University, and the other was the aforementioned opportunity to work as an extra on the movie Mad Love. Again, don’t bother looking for me; everything I was in was cut. I could have worked more, but the three days I did work meant a two week delay in my departure for Alaska, and my parents weren’t willing to delay it any more. Still, as it worked out, I had to be back a month later anyway for early orientation and registration. The schedule became a month up, three weeks back, and a month up. Yes, the time in Anchorage was rough, for all of the reasons I expected it to be. However, I will be the first person to say that there are parts of it I’m glad for; I had the chance to reconnect with some family members I hadn’t seen in years, and I was able to continue some of my vocal momentum with a voice teacher named Bettyrae Easley, who did the very practical thing of getting me ready to audition for Western’s music major, something in the post-graduation whirlwind that there just hadn’t been time to discuss with Dennis once my voice had finally opened up. Among other things, Bettyrae taught me my first French mélodie, Fauré’s “Lydia”, which served as my introduction to an entirely new song paradigm (to say nothing of the beginning of a, shall we say, complex relationship with French diction). I did wind up working a bit in Anchorage; not overly much due to the time constraints, but there were a couple of odd jobs here and there that I did for friends of my dad. Among other things, I helped a future protest candidate for the United States Senate and right-wing filmmaker move out of a landmark Lloyd Wright home, and I also spent a couple of weeks assembling and finishing ulus. One of the things that was difficult for me conceptually about preparing to go to college was that nobody seemed to actually have a clear idea in their head why I was going, or how to relate it to anything I was interested in doing, or how to relate any of those things to how I might actually earn a living on the other end. I was supposed to have been a smart kid, but none of the various things I was good at really lent themselves to careers, per se, at least as my parents or the people in their circles understood them. I was a voracious reader, I retained information, I read about all kinds of things as a kid from astronomy to cryptography to computer science to paleontology to mythology and everything in between, but what did that mean in terms of what I could do to feed myself? Coming into high school, math and science bored me silly, I hated sports, I was more interested in what computers could be used for than what they did under the hood, I enjoyed creative writing, I seemed to have some aptitudes for drawing and painting up to a point, and I enjoyed music but puberty had freaked me out with my voice change and I convinced myself I couldn’t sing anymore. There really wasn’t anything obvious in there in terms of “normal” career paths; not business, not medicine, none of that. Neither of my parents finished college and academia wasn’t anything I had ever heard of as a career. Once I got into high school and discovered that I seemed to have an aptitude for theatre and music, that was a relief in some respects and it gave me some idea of a path. The thing was, nobody took it seriously. I remember my senior year of high school telling people, I’m going to major in music and theatre. Typically, that would generate a condescending smile and a sentence that sounded something like, “Oh, well, it really doesn’t matter what you start with, because you’ll probably change ten times before you’re done.” That, frankly, pissed me off; it was clear that I was being patronized and not listened to. At the same time, I had to acknowledge that having it in my head that I would finish a major wasn’t the same thing as knowing exactly how to get to the “pay your bills” part of the deal. My parents didn’t know what to tell me. They didn’t really understand my interests, and they didn’t have any advice regarding college except get good grades and finish as soon as possible. Neither was there was ever any clear idea of what the trajectory of life post-high school was going to be for us, even before they moved back to Alaska. Was there an expectation that I was going to live with them until I got married? Was there an expectation about when it would be “okay” for me to think about getting married? None of this was discussed. At least when they were still going to be in Seattle, some small level of continuity could be assumed, but the mechanics and specifics still weren’t really talked about. After the move, all bets were off. Thus it was that I found myself in Bellingham in September of 1994, living in a dorm room in Ridgeway Sigma with one Will Bass, and most of my worldly possessions were under my then-girlfriend’s house (many of which never to be seen again, alas, as will be explained in a future installment). I auditioned for the voice major, got in, then walked over to the other side of the Performing Arts Center and declared myself a theatre major. My very first class on the first day of my freshman year was Music Theory I, taught by Prof. Jeffrey Gilliam (to this day perhaps the single most naturally musical person I have ever met, to say nothing of the very best music theory instructor I have ever had). It was off to the races. There were a number of highlights to that year: I was in my very first opera, singing Marco, one of i parenti in Gianni Schicchi (with the previously-mentioned future Metropolitan Opera baritone Aaron St. Clair Nicholson in the title role). I also got to sing the high baritone drunken abbot solo in Carmina Burana (“Ego sum abbas Cucaniensis… WAAAAAAAAAAAAFNA!”). My friend Gavin Shearer sat me down at some point in the fall to show me this awesome thing that was happening in computers called “the World Wide Web” that used this amazing program called Mosaic to do what Prodigy and AOL had utterly failed to do up to that point. Two portentous occurrences: a master class with a voice teacher named Roy Samuelsen from Indiana University, a school I had never heard of before but that apparently had quite a reputation for opera, and dating very briefly this lovely brunette named Megan McKamey, who was absolutely wonderful in every way, but everything going on around me made it difficult to feel capable of committing at the level I felt she deserved. The trouble was, my parents and I didn’t even get through the first quarter without some massive meltdowns. The situation was complex; Seattle was still home for me, and I would go back on the weekends, because I felt very much alone at Western. My parents didn’t want Seattle to continue to feel like home for me, since from their perspective I needed to start thinking of Anchorage as home, but from where I sat they had moved, not me; I was just following the plan we had always had, and… yeah. The whole situation had nowhere to go but down. At some point it was suggested that maybe the whole idea of me going to college at Western was no longer tenable, and that marked the point where the irreconcilable differences in how we saw what was happening meant that there was basically no reasonable conversation to be had about anything. There was a brief period of rapprochement over spring break; my paternal grandmother passed away, and my dad and I spent the week together while he cleaned out her condo. Still, once summer came and I made it clear I wasn’t going back to Alaska, whatever brief peace had been achieved was broken. “In ten years you’re going to remember this moment as the day you pissed your life away,” I recall being told on the phone. What drove me absolutely batty about all of this was how inevitable it had all seemed from the time my dad had announced that he was going back to Anchorage, and everything was happening exactly as I had feared it would. Nobody had listened to me, and somehow I was being blamed for it. The stress made me a charmer to deal with, I’m sure; certainly it impacted a number of relationships I valued, but there just wasn’t anything I could do. I wasn’t equipped to deal with any of it, and I had no particular support system to fall back onto. That summer I worked at Computer City, sold the first copy of Windows 95 at midnight of 24 August 1995 (there used to be a photo online of me ringing it up, not sure where it might be found these days), and took voice lessons from Dennis Kruse. We were working on preparing me for opera auditions at Western in the fall — the opera was Marriage of Figaro, not exactly a huge tenor show, but Basilio would be worth it for a kid like me. “O wie ängstlich” from Mozart’s Abduction from the Seraglio was the audition piece we worked up, and Dennis put me as the last singer on his summer studio recital, even over some of his students who were ostensibly his stars and who had made it clear much of the time I had worked with Dennis that they thought I was a waste of his time. Sophomore year wasn’t exactly an amazing improvement over freshman year. A high school friend and his mother — J. P. had been the Danny Zuko in Grease! and Tony in West Side Story, and was also a student of Dennis Kruse — were killed in a car crash in the fall, which led to a reunion nobody particularly wanted. Fallout from that, plus still trying to figure out how to resolve the family situation, meant that I was even more of a wreck that year than I had been my freshman year. I agreed to spend the holidays and the following summer in Alaska, hoping that it would ease off some of the tension, but if anything, it ratcheted it up. Marriage of Figaro was fun, but it was a bizarre reconstruction/translation that basically turned it into musical theatre — the recitatives were replaced with spoken dialogue from the Beaumarchais play. There were a number of practical reasons to do this, I suppose; hiring a harpsichordist and having the time to coach the recits properly being two of the major concerns, as I understand it. They had piddled away the fall quarter with a lot of political nonsense over sets and casting professionals for Figaro and the Count in one of the casts, and didn’t even post the cast list until sometime towards the end of the quarter, even though auditions had been in September and the performances were set for March. It was a strange experience all around. I wound up in Alaska three weeks before the end of the quarter. I was supposed to work for my mother’s company over the summer, and they had revised their policies sometime in the spring so that everybody for the summer needed to be in place by 1 May. “So, you’ll just have to come up here early,” I was told. Um, the school year isn’t over? Not even close? “The opportunity cost of you finishing the quarter isn’t worth it. Anybody with half a brain should be able to see that.” Did I mention that I was a first generation college graduate? I negotiated what I could with my professors (which in some cases, meant taking Fs). I can’t say I exactly made myself popular with anybody during this time, and not for no reason. I was a basketcase through and through, and nothing I was trying to do seemed to work out in a straightforward fashion. Going to college right out of high school had turned into a disaster; I was unprepared for it, my parents were unprepared for it, additional circumstances meant that there was additional burden for all of us to bear, and my friends were unprepared for how unpleasant of a person the whole experience was making me. Summer of 1996 I cannot describe in much detail without going into things that I’d rather not discuss publicly. Suffice it to say that I got a front row seat for much of why my parents were freaked out over me being 2,500 miles away; a lot of the unpleasantness that had been plaguing our family life since the mid-1980s had come home to roost with their move, we were all now having to confront it head on, and none of us were doing a particularly good job. I returned to Bellingham in September unsure of what kind of a relationship would be possible with my parents after certain events, conversations, and revelations. I focused on what I could, namely, trying to rebuild my relationships at Western. In short, however, that ship had sailed, and now I had to sleep in the bed of frustrations I had made the previous two years. Whatever had been the cause of all my erratic behavior, certain relationships were damaged beyond repair, and I continued to make unhealthy decisions with respect to other relationships. I couldn’t find a way to focus on being at school, partially because the muddied reasons I had for being there continued to get muddier, partially because all of my personal issues made it impossible to ever feel sufficiently centered and stable. I also made some poor choices vocally — Dennis had gone to a lot of trouble to figure out how to work much of the tension I usually carried with me out of my voice, a wonderful teacher named Virginia Hunter had done a very nice job teaching me to sing with the instrument Dennis had shown me I’d had, but that year, for reasons that seemed great at the time, I switched to a teacher who went out of their way to work all of that tension back in. Within three months my top was completely gone and my voice had regained a strangled quality that I thought had been left behind after graduating high school. There was one more factor in this equation. In fall of ’96, I became aware of some behavior on a faculty member’s part that I believed (and believe) to be unethical, and at the very least political maneuvering at the expense of students. I attempted to seek advice on how to deal with these things in a way which I thought to be private which instead publicly blew up in my face. Later, I understood that whatever my concerns were, the way I sought to deal with it was totally unprofessional on my part and embarrassing to the faculty member in question. This culminated in a letter from the chair of the department telling me that all three of us — he, the faculty member, and I — would likely be happier if I went someplace else. So, midway through winter quarter, so many threads having come unraveled, I decided that college had become a gigantic, expensive exercise in beating my head against a brick wall, and it was time to acknowledge that it just wasn’t the right thing for me to be doing at that moment. I subsequently dropped out in disgrace, with the straw that broke the camel’s back being something which really was entirely my own fault. Today I would deal with a similar situation very differently because I would understand better what was happening; the bottom line is that when someone’s on a tenure track, you either play along or get out of the way, particularly under circumstances where resources are scarce and only so many people can get what they want. Anyway, after flailing about for a few months and still making really bad decisions (almost reflexively, at this point), I started selling classified advertising for the Bellingham Herald and trying to figure out how I might be able to move back to the Seattle area. 1994-1997 was a difficult, unpleasant time. It is difficult to even know where to begin explaining that the poor, confused, unhappy person who arrived at WWU in the fall of 1994 was not me at my best, not by a long shot. I started college not having any idea which way was up and having nobody, really, to whom I could turn. I was trying to do everything right which I possibly could, but there was just very little good that anybody could do for me, and trying to do everything right when one doesn’t even know what all one needs to do means one is bound to get quite a bit wrong. There continue to be ramifications to this day — people who don’t talk to me because some of my choices, people who, even if they’re still friends with me, can get easily upset when discussing some of what happened, and other consequences. A few years later, I did my best to apologize to everybody I hurt in those years, with somewhat mixed results. Whenever I think about that period, it is with a lot of pain and regret, but also a lot of confusion. In broad strokes, under the circumstances, I have a hard time imagining what I could have done differently that would have been any better beyond, quite simply, dropping out earlier. The kind of wrench my parents’ move threw into the works was comprehensive, I had no idea how to deal with it, my parents had no ideal how to deal with it, and they had no ideal how to help me deal with it. In retrospect, maybe it would have been better for me to find a way to work full-time while doing an Associate’s degree at a community college and continuing to study with Dennis. The trouble with that, however, was that I didn’t really have a place to live available to me full-time. Moving to Anchorage would have cut me off from much of what I was trying to do post-high school, and would likely have only hastened the inevitable. Maybe I could have just taken a year off out of high school to figure things out — I was starting college at 17, after all, thanks to my skipped grade — but that wasn’t really presented as an option. The expectation had always been that I would go to a four year college right out of high school; it was exactly what I would do while I was there and what would happen after that were all quite vague. I should note that there are a number of people from this time for whom I remain grateful: an incomplete list includes Brian Ward, Holly Zehnder, Mike Cook (memory eternal), Peter and Arwyn Smalley (née Moilanen), Suzann Miller (née Welch), Jon Haupt, JOHHHHHHHHHHHHN Davies, David Harsh, Jon Lutyens, Matthew Murray, Kai Morrison, Dennis Kruse, Tom and Jordin Baugh (née Peters), Matt Carter, Sue Fletcher, Sarah O’Brien (née Wright), Liz Holmes, Eric Rachner, and, of course, Flesh of My Flesh herself, Megan Barrett (née McKamey). Whew. Another academic year, Lent, Holy Week, and Pascha have come and gone. It’s not exactly the most convenient thing for me, in my various modalities, to have the end of spring semester and the Paschal season line up the way they do, but there we go. I better learn to live with it. It was made more complicated this time around by getting really sick Monday of Holy Week, having to muscle through, collapsing after the lamb roast Sunday, and finally crawling out of bed to go to the doctor the following Friday. Even now, a good two weeks after the Z-Pak, I’m still somewhat on the mend. The month of May is going to be largely a hodgepodge of exam reading, baby prep, and Dumbarton Oaks prep, so I’m not sure it’s really going to be any less stressful, but there we go. So, where were we… I guess I had made an attempt at the end of my senior year to go back to the expression of Christianity proper to my Danish heritage, and then I graduated high school. The summer after graduation was stressful and complicated. My parents’ move had left me without any real place I belonged; they wanted me in Anchorage with them for the summer, which isn’t really where I wanted to be. The details of that part of the story will have to be left for the next addendum, but the short version is that between going back and forth a bit between Alaska and Seattle, navigating various issues on how I’d actually start my freshman year at Western Washington University, and, well, starting my freshman year, whatever spiritual momentum I may have gained from my attendance at Northlake Lutheran completely dissipated. I was able to visit there once over the summer during one of the trips to Seattle, and talked to Pastor Chris about what was going on. “Well, we’re praying for you,” he said. When I got to Bellingham, I had absolutely no idea what do in terms of churches. I was limited to my on-foot options, which weren’t fantastic. My evangelical friends were super-involved in The INN University Ministries, and I went once, but it was everything that had made me uncomfortable about Overlake’s high school group turned up to 11, with what struck me as a baffling appropriation of youth culture. (Keep in mind I felt this way and was articulating it more or less with these words at 17.) Why, oh why, would you use the Lemonheads’ “Into Your Arms” in the context of Christian worship? Was it supposed to make me want to sing along? Well, it didn’t, it made me look for the nearest door. Call me a grumpy old man beyond my years (and I’m sure some of my friends did), but I could only read it as pandering. I didn’t want to be pandered to, and as a teenager I really didn’t want to be pandered to as part of an interest group called “teenagers”. I wanted to be part of something that would transcend whatever concerns and tastes informed my latest mix tape, and I didn’t (and don’t) understand why that premise appeared to be overlooked at best and treated with hostility at worst. I joined a “care group” (now apparently called “small groups”) that was led by one of my INN friends who was a fellow voice major and former Dennis Kruse student, but beyond that I felt like there wasn’t a spiritual home for me in Bellingham. One aspect of this that perhaps might be predictable is that the more I was exposed to the masterpieces of sacred music as a singer in training, the more my discomfort with modern praise music was amplified. I remember having a conversation with the same friend who had told me that I didn’t belong at Overlake. He was easily the best friend I had in those years (which is part of why I had to take his conclusion that I just didn’t fit in there so seriously, and why it kind of stung), he also wound up at Western, and he was heavily involved in the INN. He provided continuity for me that was vital, and we talked about a lot of the Big Things in those early college days. I was talking to him about lacking any kind of a spiritual home — not a new conversation topic between the two of us, obviously — and he, as per usual, didn’t understand why I couldn’t just adapt to Protestant America’s cultural norms. For him, there was a fundamental assumption that that’s what “real Christianity” looked like for most normal people, so what made me so special that I couldn’t deal with it? My points about transcendence didn’t make any sense to him. “Why?” he said, when I explained to him that some kind of historically-rooted practice of music and worship seemed important. Because otherwise it’s no bigger than we are, I said. “Yes, but why is that important?” he insisted. Everything about his evangelical milieu that made me felt like an outsider was precisely what made it authentic, normative Christianity for him, and what my instincts were telling me to look for came across to my friend as no more than question begging from somebody who just didn’t want to deal with what Christianity actually is. I should point out that there was an emphasis at both Overlake and at the INN on being nonsectarian. It became clear to me that “nonsectarian” usually manifested itself practically as a lowest common denominator form of worship, a reluctance to talk about theological detail (and yet a base assumption of some form of Reformed Christianity that was probably more anti-Catholic than anything), and occasionally, if pressed, some discussion of what each denomination got wrong from the “nonsectarian” viewpoint. In other words, it really took on its own forms, values, and dogma, becoming a “sect” or “denomination” in its own way. My friend’s responses in some of these conversations maybe make more sense from that perspective; the things I was concerned with were generally products of one “sect” or another (liturgical practice, musical traditions, historical expressions, etc. ), and since really they were all more or less problematic, why not just flow with whatever cultural tide is coming in, particularly when it’s going to be a lot easier to reach people that way anyway? Between the personal crisis that I was dealing with my freshman year (basically the culmination of much of what had been going on in my family since 1986/1987, brought to a head by the fact that we were now geographically separated) and my inability to find a church home under the circumstances that was anything like Northlake, my renewed sense of loss of place put me pretty much back where I had been throughout much of junior high and high school. Someone who self-identified as a Christian but who had no Christianity to identify with. I must compress some events here, simply because there is about a 14 month period between major developments in which essentially nothing of any importance occurred. In the spring of 1995, I got a phone call from one Vernon Greenstreet, the organist and choir director at St. Paul’s Episcopal Church. His usual tenor section leader had a conflict on Pentecost Sunday; might I be able to fill in at the rehearsal and the service for $40? So, here was my first exposure to multiple ideas — one, that a church in the present day might actually have an “organist and choir director”. Two, that somebody might be paid for singing in church. Three, that there was such a thing called “Pentecost Sunday”. Four, that there might be a set of circumstances in which it would not only be appropriate for somebody like me to sing in church, but I’d even feel comfortable doing it. It was also my first time ever darkening the door of an Episcopal Church; I knew absolutely nothing about it, except that a Roman Catholic friend of mine in high school had once jokingly called it “Catholic Lite — all the salvation and none of the confession”, and I had no idea what to expect. But the salient point for this young tenor finishing their freshman year of college was that somebody was offering me money to sing, the very first time anybody had ever done so. I said yes, of course, while indicating I would need a ride to rehearsal and to the service (St. Paul’s was too far away from campus to realistically walk). No problem, Vern said. Sunday morning I was picked up by future Metropolitan Opera baritone Aaron St. Clair Nicholson, who was singing the solo for C. Alexander Peloquin’s “Psalm for Pentecost” (ah, whole tone scales…) (which was also my first, and by no means last, exposure to the repertoire published by GIA). The whole morning was a little surreal; St. Paul’s is (was? I haven’t been there in over 10 years) a big, beautiful, old-style brick church with thick carpet, high vaulted ceilings, stained glass windows, rood screen, stations of the cross, lady altar, chancel with choir stalls, and high altar. It represented a number of firsts for me; first time in a choir robe, first time processing, first time in a choir stall, and so on. The liturgy seemed reasonably similar to the Lutheran service at Northlake, so it was familiar in broad strokes, but the physical setting and the way it was celebrated suggested something with deeper roots. And by contrast to alt-pop songs being appropriated by a worship band, Peloquin seemed to at least strive for a certain standard of English language liturgical beauty. Skip ahead to summer 1996. The 1995-96 school year had gone by with a phone call or two from Vern, but we were never able to quite make all the connections work, and for a number of reasons that I’ll explain later, I found myself in Anchorage with my parents a full three weeks before the school year was over. One day in July, an item in the Anchorage Daily News caught my eye, something about a controversial bishop whom I had never heard of before named John Shelby Spong doing a series of lectures in Anchorage on a book tour. I think I still have the clipping somewhere; humorously enough, on the other side is a story about a brand new invention that will change everything called a “cable modem”. If I can find it I’ll scan it and post it. Anyway, Spong was the Episcopal Bishop of the diocese of Newark, and all I knew of the Episcopal Church at that point was that one Pentecost service fourteen months previous, I knew nothing of the office of a bishop, I knew nothing of the details of what he preached, but reading the article I found out that there was somebody, a Christian leader, who took even less of the Bible literally than I did, and who said that in and of itself, that wasn’t a bad thing. I read Rescuing the Bible From Fundamentalism and Living In Sin?, and while I certainly didn’t buy everything he had to sell, I still found a fundamental point very important—that there could be differences of opinion on some things without it necessarily making somebody a non-Christian. At that point, anyway, that was a message I needed to hear. I went to his lectures while he was in town, and I got to chat with him a little bit. I found the lectures fascinating and him quite congenial; again, I didn’t believe everything he had to say, but it marked the first time I had ever heard somebody even try to put Scripture in context as a way of illuminating its meaning. Such things simply were not done in my experience up to that point. When I returned to Bellingham that fall, I received a phone call from Vernon Greenstreet, who wanted to bring me in as the regular tenor section leader/soloist. St. Paul’s Episcopal Church thus became my de facto church home. I became friends with the associate organist, who had in a previous mode of existence — so to speak — been an Anglican monk, and expounded at great lengths about Anglican heritage and practice. I was painted a picture of a Christian heritage that kept its connection to history and Catholic identity while not requiring one to swallow the specificity of Roman Catholicism’s claims or to check one’s brain at the door. In this setting, I heard the words “Sacraments” and “Real Presence” and “Tradition” for the first time, as well as the notion that liturgy was an expression of belief, not an impediment to it — lex orandi, lex credendi, in other words. The real catechism, however, was from the chancel, where I quite literally had a front row seat for much of what appeared to give the liturgy and Sacraments depth, even in the context of watered-down Rite II. It’s amazing how much gravitas a rood screen, choir stalls, and pipe organ seem to provide. (Ah, but they stopped short of incense; the thurible was treated as an unwelcome relic of the past, to be brought out only at moments of absolute necessity and then to be employed with maximum economy and at least a week’s warning.) The whole picture seemed to bring alive, at least in some way, five hundred years’ worth of Christian history. The priest, Fr. John Gibbs, came across as a kind, orthodox, welcoming man who wanted to cultivate where my interests seemed to lie, not chase me away because I didn’t think that it was necessary to believe in young earth creationism or think Bill Clinton was the antichrist. (I have since heard stories that lead me to believe that perhaps he was not as orthodox as he seemed; hard to say.) And, well, if Vern wasn’t exactly the high church true believer that my organist friend would have preferred, being there was a godsend in every respect (including being paid to be there, I must admit — making close to $400 for Holy Week, recompense that has yet to be matched in any other setting, was very much appreciated). In any event, it was clear to me that God was there, and that that was where God wanted me at that point. When the words “Confirmation class” were uttered, I signed up (although for all practical purposes my organist friend was in charge of catechizing me, since the class was the same night as choir rehearsal). On 29 June 1997, at the age of 20, I was confirmed by Bp. Vincent Warner of the Diocese of Olympia, and got to sing L. J. White’s “A Prayer of Richard of Chichester” (the standard text of which, I am obliged to add, does not include the phrase “Day by day”, no matter what Stephen Schwartz wants to tell you) a duet with flute for the service. Alas, no family or friends came to my Confirmation; nobody who was around understood what was going on or what I was doing. My mother (who was in Alaska anyway) insisted that I had been raised as a fundamentalist Protestant; what did the seven sacraments or the three legged stool (for the uninformed — Scripture, Tradition, and Reason) have to do with Jesus? The girl I was with at the time identified as a pagan and wanted nothing to do with it. My INN friends most certainly didn’t get it (even though it was entirely consistent with everything I had been telling them for years). My organist friend had disappeared in the spring under what I will describe only as unpleasant circumstances, and I never saw him again. One very interesting outcome of my taking the road to Canterbury that I didn’t even notice until much later was that it represented the first intermingling of my spiritual life with my professional aspirations. There would have been no place for the kind of singer I was in a setting like Overlake, but at St. Paul’s I started to think of myself as a “church musician”. Naturally, as I settled in at St. Paul’s, other complex matters arose that made my post-confirmation time there necessarily short-lived. More to come. Sorry about that.